J.Bob Alotta chats with outgoing Director of Programs, Cara Page about healing justice, holistic security, and what’s next for philanthropy. Astraea has always had the immense pleasure of bringing so many incredible, inspiring, fierce leaders from within our own movements into our team. Cara Page, outgoing Director of Programs, joined us in October 2017 to steward our International & US grantmaking and programs toward our shared vision for racial, gender, and economic justice. At the end of March 2019, Cara will shift out of her full-time role at Astraea to make time for political projects which continue to build on these visions of justice. Cara will continue on as an advisory strategist on healing justice with Astraea. Executive Director J. Bob Alotta sat down with Cara to reflect on her time at Astraea and hear more about what’s next. Bob: Cara, we’re obviously very sad to see you go, but we’re really excited about what’s next for you and what you’ve got in the works. Can you share more about what is critical about this shift at this time? Cara: There is a heightened call to action to respond to increased surveillance, policing and safety. It has taken about a decade to arrive at this level of visibility and I could say it’s based on increased fascism and natural disasters around the world, but I think it’s also a direct response to the increasing resiliency and visibility of movement building strategies centering physical, emotional, digital security and well-being. That’s what I find this moment to be about, and I feel committed to engaging with this work in a different way to meet this moment. I’m rolling off to do work in multiple spheres to build long-term infrastructure for safety and wellness as integral to our movement strategies; and Philanthropy is certainly a powerful sphere in there. Bob: Thinking about those multiple spheres, what are some of the projects you’re taking on as you transition out of your full time role at Astraea, and what it is about your work at Astraea that led you to delve deeper into those projects? Cara: Astraea is a feminist foundation that centers gender and racial justice, and has been funding healing justice, safety, and security, since its beginnings. I came in at a particular moment of picking up that lineage; there were resourcing requests from our grantee partners saying that they’d always seen Astraea as offering avenues to fund healing justice, safety, mental wellness, recovery, and transformational work, even if it wasn’t always called that. My time here has been a lot about advising our philanthropic partners to think about where movements are inviting us to bend, adapt and explore how they are responding to generational trauma from violence and oppression, and how healing is central to their collective survival and liberation. In my role as the Director of Programs I’ve brought expertise as a U.S based organizer, and Astraea’s given me an opportunity to learn about global perspectives on this work and the way holistic security and healing justice are moving and shifting in a global landscape in response to closing civil societies, to natural disasters and to heightened surveillance and policing of our communities. My work has moved into mapping sites of resilience and strategies that respond to state violence and trauma from systemic oppression. 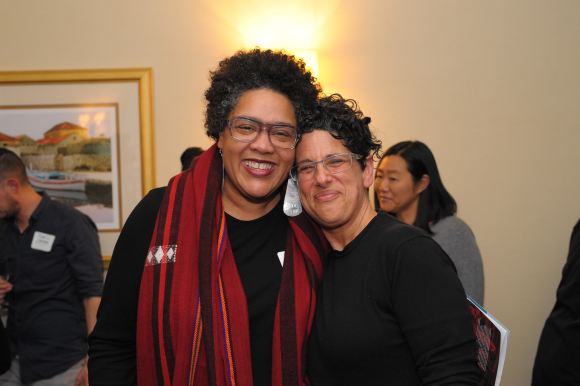 Bob: We are grateful to have had the opportunity to have worked with you and benefited from your wisdom and experiences as a Black, Queer Feminist organizer and cultural memory worker. What are some of the things you are reflecting on about your time at Astraea, and what are the learnings you are taking with you into this next phase? Cara: I am deeply committed to the transformative roles that philanthropy can hold. Astraea is positioned to do transformative work that centers feminist principles and ideology that are integral to safety, spiritual, emotional and physical wellbeing. This is the time for philanthropy to answer the call from movements about how we are resourcing and looking towards the future to build long-term infrastructure that sustains our land, our communities and our collective wellbeing. We have to ask how are we sustaining land, healing, safety, and wellness as an integral part of our liberation. These are not separate and Astraea has taught me how to engage with philanthropy to ask these questions. Bob: Finally Cara, what are your hopes and wishes for Astraea? Cara: In the heightened movements for migrant and racial justice, we know it is our grantee partners that are building transformation and power! My hope and wish for Astraea is that we keep pushing the edge and keep moving ahead and forward of ourselves to imagine what it is we would like to fund and build with movements. We need to push these conversations and really commit to long-term infrastructure that goes beyond this current moment. We’ve really got to imagine our future into being! Bob: We as Astraea have certainly gained a lot from being in partnership with you. Apart from your skills and experiences, it has been a reminder that this work – the work of our communities – is not linear, and does not take just one form. Astraea has always been composed of the people and activists who make up our communities, and for our part, we’ve always tried to be as embedded in our communities as possible. And so, the work we have done together, and the work you are going on to do, exists in concentric circles, and it is in working both together and alongside each other in these ways that we are going to continue shift power in and for our movements. If you are a bold, badass changemaker who wants to help us keep building power for our communities, we want to welcome you to join the Astraea team! We’re hiring for some really cool positions and consultancies at the moment, and we’re also always looking for more volunteers. Note: Along with her continued consulting work with Astraea, Cara will be launching a new project called the Changing Frequencies Project; which includes co-curating and touring a digital timeline of the medical industrial complex in the U.S. that maps scientific racism, experimentation and policing of our communities. Cara will also be training up and strategizing with organizers, bioethicists, researchers, health practitioners, & healers to strategize interventions on and hold institutions accountable for abusive historical and contemporary practices in the MIC as an extension of state control, and also imagine the ways we intervene to make sure these practises end.